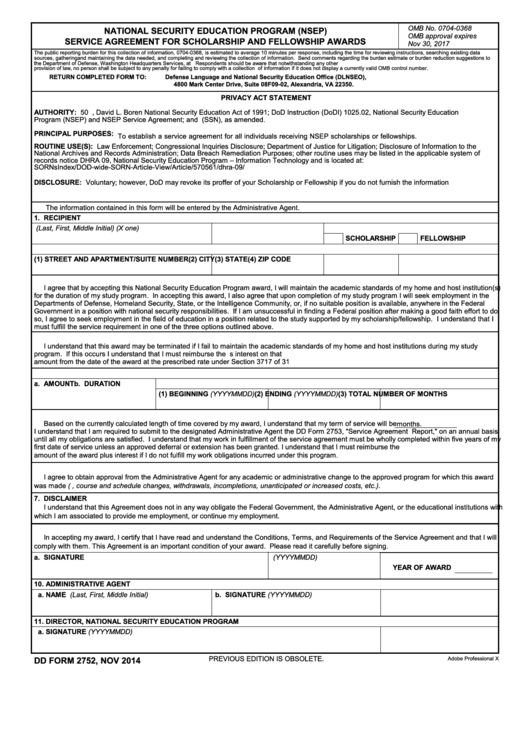 Download a blank fillable Dd Form 2752 - Nsep Service Agreement For Scholarship And Fellowship Awards in PDF format just by clicking the "DOWNLOAD PDF" button. Complete Dd Form 2752 - Nsep Service Agreement For Scholarship And Fellowship Awards with your personal data - all interactive fields are highlighted in places where you should type, access drop-down lists or select multiple-choice options. provision of law, no person shall be subject to any penalty for failing to comply with a collection of information if it does not display a currently valid OMB control number. 4800 Mark Center Drive, Suite 08F09-02, Alexandria, VA 22350. Program (NSEP) and NSEP Service Agreement; and E.O. 9397 (SSN), as amended. PRINCIPAL PURPOSES: To establish a service agreement for all individuals receiving NSEP scholarships or fellowships. The information contained in this form will be entered by the Administrative Agent. must fulfill the service requirement in one of the three options outlined above. amount from the date of the award at the prescribed rate under Section 3717 of 31 U.S.C. amount of the award plus interest if I do not fulfill my work obligations incurred under this program. was made (i.e., course and schedule changes, withdrawals, incompletions, unanticipated or increased costs, etc.). which I am associated to provide me employment, or continue my employment. comply with them. This Agreement is an important condition of your award. Please read it carefully before signing.